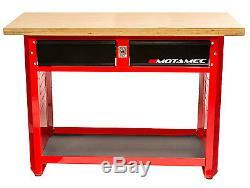 Motamec Motorsport M50 Work Bench Heavy Duty Workstation Workbench Red / Black. 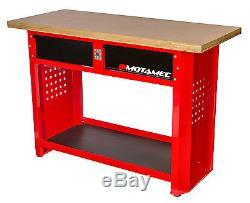 Motamec Motorsport M50 Series Workbench - 2 Drawer Motorsport Inspired, professional quality tool chest unit, as use by race teams and professional garages. 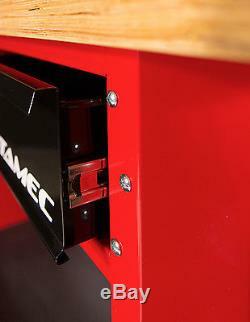 Heavy-duty welded steel construction for strength and durability High Gloss powder coat finish, solvent and rust resistant 40mm heavy duty wood laminate top Open lower shelve for storage of larger items 4 x Adjustable feet for levelling on uneven ground 2 x Built in heavy duty steel drawers Ball bearing drawer runners provide superior performance and carry heavier loads Non-slip drawer liners Integral locking system locks all drawers with the turn of 1 key. Additional charges may be incurred for missed deliveries. 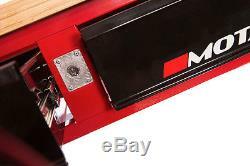 This product has no reviews yet, however see what our buyers say about our other products.. All our listing prices include VAT. Additional charges may be incurred for Scottish Highlands and non mainland Britain. The following postcodes affected are: IV, HS, KA27-28, KW, PA20-49, PA60-78, PH17-26, PH30-44, ZE, BT, IM, TR21-25, EH, TD, JE, GY & TR. 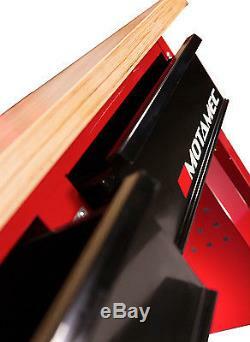 Motorsport-Tools UK - We are a growing dynamic company based in North Wales, specialising in Tools & Equipment for Motorsport and the Automotive trade. 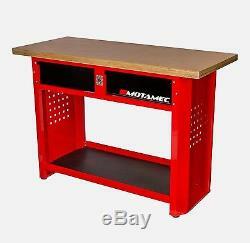 Our aim is to supply professional quality tools, parts and accessories at affordable prices. 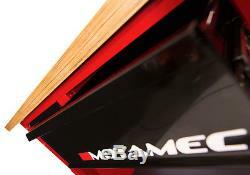 Our customers range from top Race and Rally teams in the UK and Europe to DIY Mechanics worldwide. We have our own warehouse and distribution centre with direct links to leading brands and manufacturers throughout Europe and the USA, enabling us to supply our products fast and direct to the customer. We pride ourselves on our feedback record and as you will see we always put you the customer first! All our listings include VAT at the current rate. 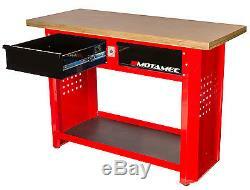 Motorsport-Tools UK Llithfaen Pwllheli Gwynedd N Wales (UK) LL53 6NH. 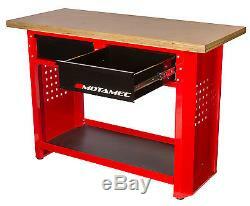 The item "Motamec Motorsport M50 Work Bench Heavy Duty Workstation Workbench Red / Black" is in sale since Saturday, March 25, 2017. 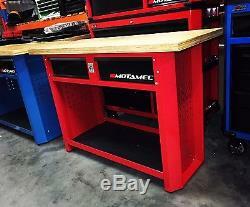 This item is in the category "Vehicle Parts & Accessories\Garage Equipment & Tools\Workshop Equipment & Supplies\Other Workshop Equipment".